I found the picture of him in an old souvenir magazine, wearing that old trident cap, smiling forever, frozen in optimism. The team picked him up that winter because that’s what the team did back then: they combed through the trash, looking for new names to sew on the jerseys, new faces to learn and forget. Clint Hurdle hit .400 in Spring Training. He got along with people. The coaches told him he’d won a job. Then, an hour before game time on Opening Day, the president of the team called him in and told him he didn’t. Seems they’d found a new piece of scrap, some guy named Phelps, for $35,000. A pittance, or a year’s worth of work. Clint Hurdle went to the Mets. He’d hurt his back the previous year in Cincinnati, which is why they’d given up on him, and it flared up again after a dozen games. He was finished. He stuck around anyway, rode the buses, earned a few more call-ups, learned whatever they asked him. He tried catching. Eventually, he was no longer worth the roster spot, so he became a coach, and then a manager. He had kids, maybe. I don’t know. You just wasted two minutes reading about Clint Hurdle. He doesn’t matter. Sure, there’s a real Clint Hurdle still around managing the Pirates, and doing well at it for now, but that’s not important. He’s not really Clint Hurdle, any more than Pat Putnam is Pat Putnam; they’re pages, or bricks, pieces of past tense. In the story of the Mariners, and in the story of most of us, Clint Hurdle is a string of keystrokes and nothing more. When we were kids, we used to project our lives into the world of baseball players. We imagined facing Nolan Ryan or Randy Johnson, made it the bottom of the ninth, pulled back our wifflebats, and closed our eyes. We let the wind through the leaves become the impatient crowd, the summer sky the burning overhead lights of the stadium. Now I’m older, and I project baseball players into my own world. I imagine Clint Hurdle walking out of that office, asking some of the staff for some quarters, making a long-distance call at the phone booth outside the stadium, asking the cops to track down his father driving up from Florida to tell him to turn around. I imagine him leaning against the concrete wall afterward, thinking how cold it felt. I can go farther, and imagine Hurdle walking to Pioneer Square, looking for a bar that didn’t have the game on, tearing the label off his fifth bottle of Budweiser. Abba is playing on the jukebox. He suddenly realizes that twenty-four can feel a lot like thirty-five. He leaves the dregs of the beer in the bottle and walks out of the bar, out of the edges of my imagination, and ceases to exist. I can go so far as to pretend that Clint Hurdle is a real person, not just a collection of numbers or a face on a baseball card or a factor in whether a given team wins a game. I don’t really want him to be, though. If he were a real person, I’d have to care about him in some small way, and caring about people is exhausting. It’s hard enough caring about Yemen. It’s multi-tasking. I can’t look at a tree and look at all the leaves at the same time. Baseball is a tree, I guess is what I’m saying. Clint Hurdle is a leaf. Instead a thousand Clint Hurdles die and get replaced, sometimes making outs, sometimes watching Wheel in road trip hotels, sometimes appearing in transaction blurbs in the backs of sports pages. One was a Mariner for a while. 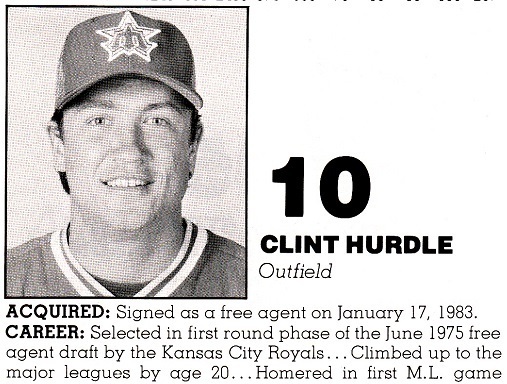 We hoped you liked reading Clint Hurdle was a Mariner for a Little While by Patrick Dubuque! Yemen: the other other white Christian country. I see you took a lot away from this article. I see you took a lot away from my comment. I see you also took a lot away from my comment on your comment. I see the comment sections is getting smarter with each NotGraphs post. That’s my style. I like to hit them when they’re down. What is the mind? No matter.